The five vintage lucite frosty clear trumpet flowers have a matte finish, all the better to set off the Great, BIG -- nearly 1/2" -- Swarovski rhinestones in their throats. 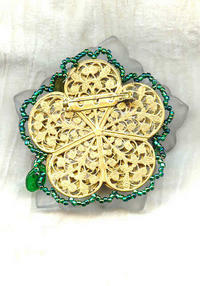 The flowers are both wired and bonded to a sturdy brass filigree finding. They are surrounded with vines of sparkling emerald green seed beads and Czech glass leaf and flower beads. 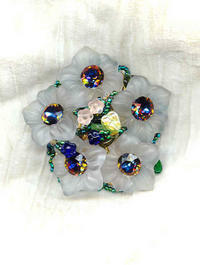 The rhinestones are an effects colour Swarovski calls 'vitrail dark,' and which flashes dark blue, amber and burgundy. The brooch is roughly 2-2/3" in diameter, and much lighter in weight than one might think. Absolutely one-of-a-kind, it's from SPARKLE PLENTY, of course.